We arrived in the South Carolina capital of Columbia mid afternoon on our Road Trip USA Deep South Tour after leaving the rainy skies of Atlanta. 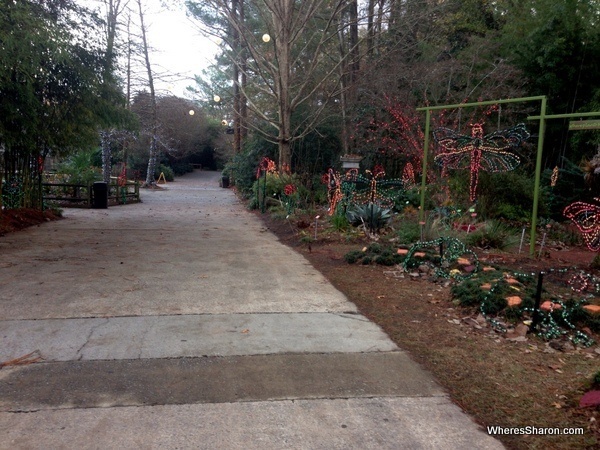 It was straight to the top attraction in Columbia SC – Riverbanks Zoo. We had high expectations of this zoo. 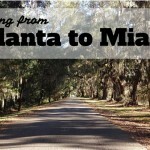 It seemed like the perfect place to start a stay in Columbia SC with kids. 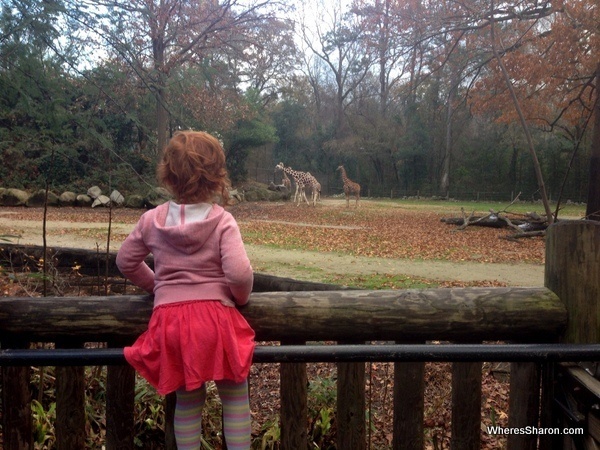 We read that it is award winning and one of America’s top ten best zoos. I hope not! There was barely anyone here which gave it a strange feel. Many shops and kiosks were shut, although they did seem to have all their “extra” attractions open which you had to pay extra for. We started our time at Riverbanks Zoo with a visit to the reptile home. It was ok, but there was not much to see. We then headed to where the monkeys, lions and tigers were. Many of these enclosures did not have any animals, at least not where we could see. We then saw some koalas. We had seen big advertisements for their koala enclosure and expected something impressive. However, there were only two koalas. We started to get a bit frustrated especially as the next area we walked to lead us to all these attractions which cost extra money. Then we were in a farmyard animal area that was also missing half of their animals. We were feeling duped. Thankfully after this Riverbanks Zoo improved, and we did enjoy the rest. There are awesome elephant and giraffe enclosures, although for some reason the giraffe walkway where you can see the giraffes without trees blocking your view was shut. At the end, we also saw some great enclosures and animals in the “Riverbanks conservation outpost”. I guess in reality it wasn’t that bad a zoo and probably worth the $33 we paid in entrance, it’s just that my expectations were high. I think they would be better off calling themselves a great small zoo, or at least advertising the fact that many animals are not there to see in winter. If I had had the right expectations, I probably would have enjoyed this smaller charming zoo. It would have also have been good to get a map and times of when the exhibits shut. I was a bit mad when we nearly missed out on a couple of enclosures because they were scheduled to shut earlier than the zoo. I would suggest finding out the closing times of all exhibits if you visit Riverbanks Zoo. 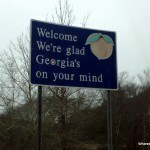 The weather was great when we visited, so it can not be blamed on this. All in all, I do think Riverbanks Zoo is worth a visit, but only if you have your expectations right. It is relatively cheap for a kids attraction, so it is reasonable value. They also had an evening lights attraction at the zoo. The place was meant to light up. It was coming on when we left, and it did look pretty. However, there are so many great lights attractions in the USA, and I don’t really understand why anyone would want to walk around a cold, empty zoo, so it wasn’t for us. 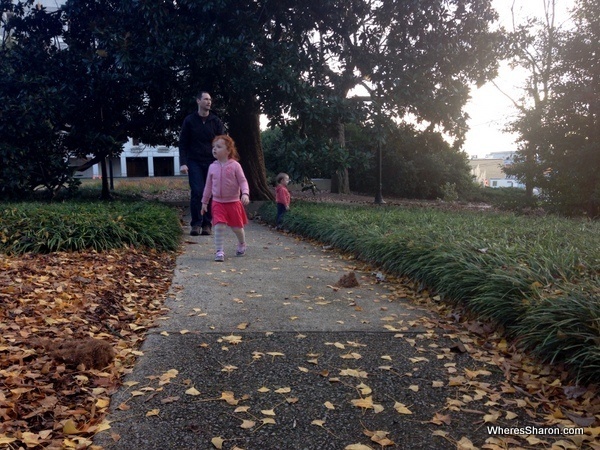 Another thing to do in Columbia SC with kids is to visit South Carolina State House. It was our fifth state capitol for the trip (check out Florida’s, Louisiana’s, Mississippi’s and Georgia’s). The South Carolina State House is a grand old building (check it out at the top of this article) with a lovely park area around it. We took our usual photos, had a run around and went on a mission to find the bronze stars on the outside of the building which signify impacts from the Northern troops in the America Civil War. 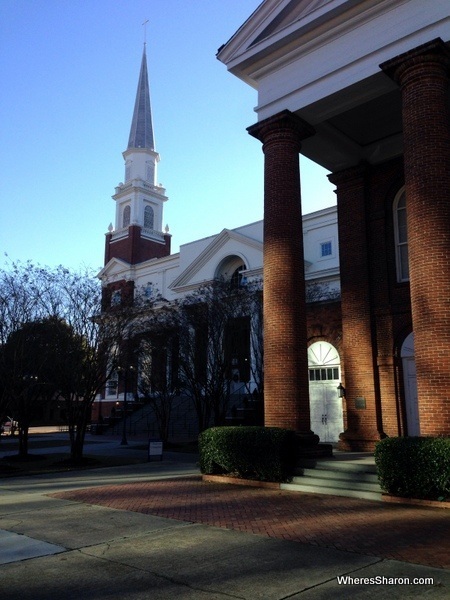 The First Baptist Church of Columbia was where a convention decided in 1960 to secede from the Union. The old church burned down next door as union soldiers thought it was this one. Thanks to this, it is still standing today. 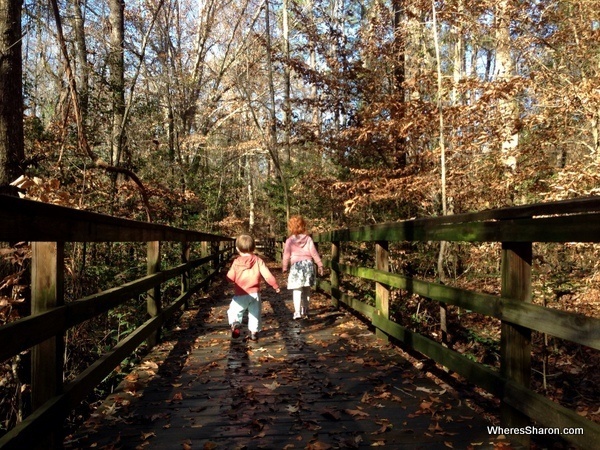 Our favourite thing to do in Columbia SC with kids was the Congaree National Park located about half an hour from downtown Columbia. There are many walks including some excellent ones on boardwalks. We did a 2.6 mile circular walk to the lake. The landscape changed a fair bit during our walk, and we saw deer and lots of squirrels. The kids handled it well. S walked the whole thing and Z about half. They mostly enjoyed it, but S needed to be distracted from refusing to continue at times. There is a visitor center on arrival at Congaree National Park with maps and information. They even have points numbered along the walk with information in the sheets so you can learn more. There are also some interesting displays in the visitor center. It is all free, and we loved it here. 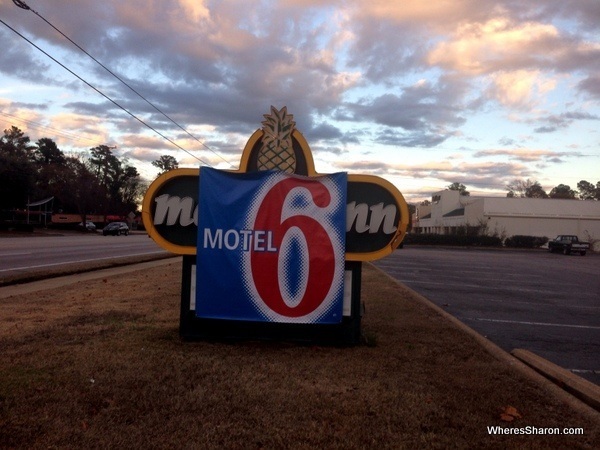 In Columbia, we stayed at the very cheap Motel 6 Columbia in Cayce. 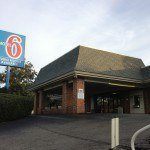 You can check out a full review of this accommodation option in what does USA budget accommodation look like? 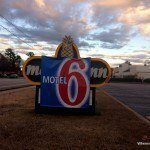 Thanks to the cheap motel, we went $30 under our daily budget in Columbia. This means we spent $106 for the 24 hours in Columbia including the zoo entry. I don’t think they were that impressed by the Riverbanks Zoo. They did enjoy the walk at Congaree National Park. It was the first time we have tried something like this, and it was a big success. We liked Columbia SC. 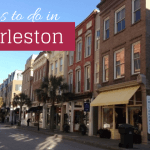 I would have liked to spend more time here to visit the South Carolina Museum and maybe the children’s museum (biggest in the South) and just to stroll around downtown. 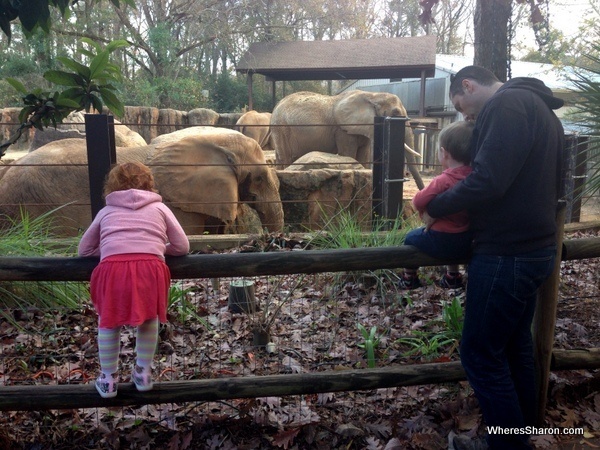 We enjoyed the Riverbanks Zoo after we got over being annoyed by the lack of animals, and we loved Congaree National Park. We were sad to leave Columbia SC so soon, but we were very excited to be heading on to Charleston. 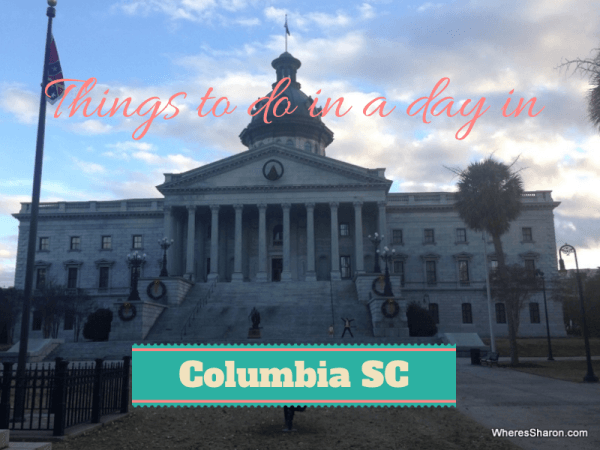 What attractions would you recommend in Columbia SC with kids? Disclaimer: This post contains an affiliate link. If you make a booking after clicking on this link then we may receive a commission at no extra cost to you. How to have the perfect Brunei stopover!